Karaoke has always been a great way to embarrass yourself in front of friends and strangers, but, until now, there’s been no way to do some karaoke on your iPod. Fortunately, Griffin makes some pretty sweet iPod accessories, and that’s only going to continue when they release the iKaraoke come Winter of 06. Besides looking pretty sleek, the iKaraoke has a ton of great features. The main being that it will wirelessly send the music off of your iPod to your stereo via a FM receiver, or you can just use the built-in line out functionality. On the microphone there are controls to pause, skip ahead or back, and even to temporarily add the vocals back in so that you can find your place. There’s even a reverb effect to “enhance” your performance. Having this at a party would be great because most karaoke machines require you to buy CDs with the music on it, and paying nearly $20 for a karaoke CD that you’ll use a couple times a year is stupid. This lets you use all of your existing tunes without purchasing anything extra, well, except the device itself. 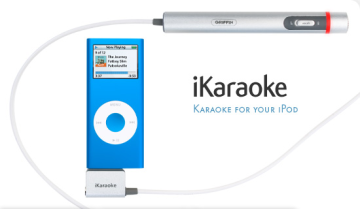 The iKaraoke will work with most iPod models; the 4G, 5G, 1 and 2G nanos, and the mini are all supported. The accessory plugs into the standard dock connector. When the iKaraoke comes it in Winter of 2006 its expected to retail for around $50, which is reasonable, and having it around for a Christmas or New Years party would sure be fun. USB Hamster Wheel – The faster you type the faster he runs! (1) Park your car just outside a local ginormous big-box retail store, figure out what frequency they are broadcasting music on (if they’ve got music) and make up your own narrated broadcast on the fly… A new wave of “airwave vandalism” is the new avenue for aspiring hip-hop artists! (2) Go into Wal-Mart or Target… Using the word “test” poke around surreptitiously on different frequencies until you hear your voice booming “TEST” on the store’s PA (public announcement) system. Then… go to a well hidden place where you can still transmit and let er rip… “Highway to Hell” comes to mind as appropriate music, or perhaps an audio transcript of that movie called “Wal-Mart: The High Cost of Low Price” which you can easily save the mp3 audio of to your iPod. (3) More dangerous but still possible. See if you can do something like the above at a public broadcast station… when they are livecasting. (4) You get the picture… have fun!